President Kagame joins fellow Heads of State and Government for a group photo at a Gala Dinner hosted by Prime Minister Abiy Ahmed of Ethiopia at the 32nd Ordinary Session of the African Union in Addis Ababa. President Paul Kagame has urged governments and members of the private sector from across Africa to work more collectively to fund healthcare systems on the continent. He delivered the message yesterday while speaking at the African Leadership Meeting on Investing in Health which took place at the 32nd Ordinary Summit of the African Union Summit in Addis Ababa, Ethiopia. President Kagame chaired the meeting which was attended by Prime Minister Erna Solberg of Norway, President Mahamadou Issoufou of Niger, and United Nations Secretary-General António Guterres among other. "We will get better results if we work together as a continent, for example, cheaper prices by negotiating and procuring as a bloc. We also have a lot to learn from each others' experiences implementing programmes such as universal health insurance and community-based healthcare," Kagame told delegates at the meeting. The President said that governments across Africa should be willing and able to increase domestic investment in healthcare if they work together. "A good indicator of this is the progress we have made toward securing the financial health of the African Union and mobilizing our own resources for joint priorities such as the Peace Fund. We should be the first ones to contribute to efforts that directly benefit our people," he said. He said that investing in the health of African citizens has already had transformative effects on the people but much more remained to be done. "That is why the outcome of this meeting is so important," he noted. He urged for tracking progress on making the investments needed to achieve the health outcomes enshrined in Agenda 2063 and the Sustainable Development Goals. "That is why the Progress Tracker tool being developed by the African Union Commission is critical," Kagame added. The president also urged the private sector to play a role beyond taxes and philanthropy, explaining that it can do more to invest in providing healthcare services. "We need to see the private sector investing more in the business of healthcare in Africa as service providers. Companies can also ensure their employees have high-quality, private health insurance coverage. This creates more demand in the market and allows governments to focus on the most vulnerable," he said. Yesterday's meeting on financing healthcare across Africa took place at a critical time when the continent is entering a period where most of its special health financing vehicles must replenish their resources. Kagame said that the current situation creates the opportunity for Africa to increase its ownership of the process of funding and improving healthcare. 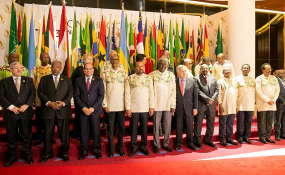 Yesterday evening, the President joined other Heads of State and Government in Gala Dinner hosted by Ethiopian Prime Minister Abiy Ahmed in honor of Heads of State and Government attending the 32nd Ordinary Session of the Assembly of the African Union. Today, President Kagame will attend the 32nd Ordinary Session of the Assembly of the African Union. This marks the end of Rwanda's one-year Chairmanship of the Union. Progress attained during his tenure includes long-standing African Union objectives such as CFTA, Free Movement, common African passport, Peace Fund, and managing Africa's global partnerships. President Kagame will continue serving as a member of the troika, which includes the current chair of the AU- President Abdel Fattal el-Sisi as well as the next chair. The President will also continue to lead the AU institutional reform process as entrusted to him by African Heads of State and Government during the AU Summit in Kigali in 2016.